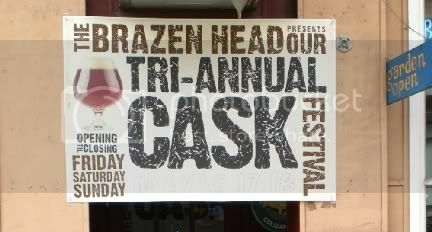 Another three day Cask Festival is about to be held at The Brazen Head, and this one I will not miss. 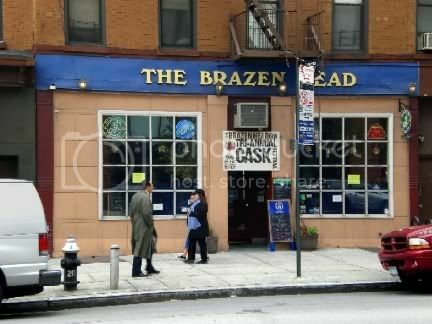 "You Get A Decent Enough Do At The Brazen Head"
That quote is from James Joyce who used to hang out in a pub in Ireland named The Brazen Head. 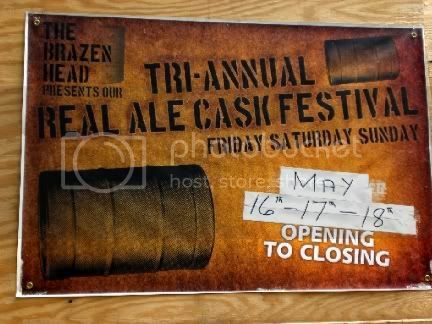 The Cask Festivals at The Brazen Head are always a joyous affair. Luckily I live close enough so that if I am in town I can easily make all three days. And I fully intend to because that is the only way you will be able to sample all of the offerings. Actually, even three days isn't really enough. They will have 25 different cask ales and lagers over the three days with at least eleven on any given day. What I also like about this festival is that you don't get little sippy cups. 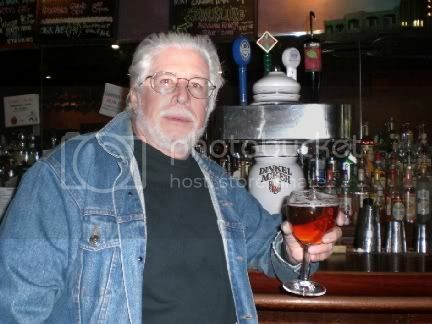 You buy your beers by the pint or a smaller glass, eight or twelve ounces I believe. To fully taste a beer you need to drink at least this amount. And no spitting allowed. 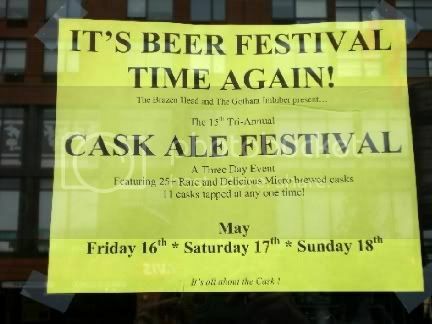 The Brazen Head always have a couple of cask offerings so I got an early jump on the festival by having a Chelsea Hop Angel. The Hop Angel is an IPA and comes in at a decent 7% alcohol. It pours a nice golden color with a frothy head that doesn't stick around too long. There is a nice citrus nose to it and just a bit to the taste as well. The hops are there, but not overwhelming like in so many IPAs these days. I could easily go through a bunch of these on a hot summer day. Sadly it was a chilly, overcast and damp day so I only had the one. 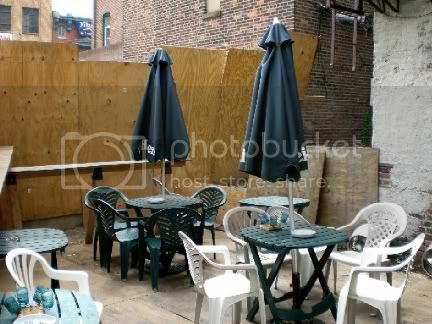 There is a little outdoor area in the back that I am sure will be packed during the festival. 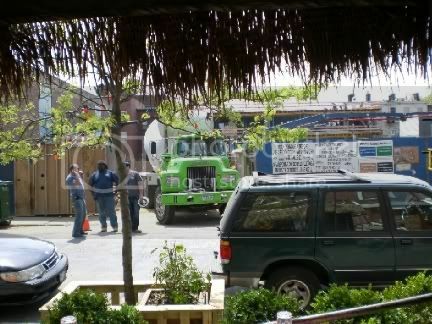 I noticed that they were hauling in cement and tiles today so I think they are going to upgrade the patio in time for the festival. There was another big sign announcing the festival on the plywood wall out back. You can see that the dates have been changed. They were originally going to have it next week but someone decided that maybe having it on Mother's Day wasn't the best idea. I am glad they changed it because I will be in Minnesota that weekend for the opening of fishing. I would encourage you to show up early for this because by mid-afternoon many of the beers and ales will be gone. 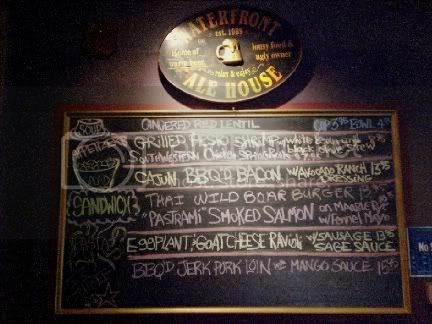 Last night I had a hankering for some barbecued ribs and so headed to one of my favorite bars, Pete's Waterfront Ale House. 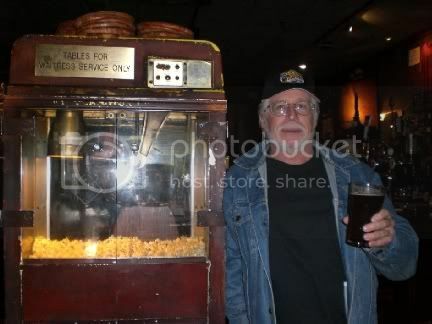 Now I know that good bar etiquette suggests that you should know what you want when you belly up to a bar so as not to waste the bartender's time. I try to make a habit of this but sometimes circumstances don't allow it. 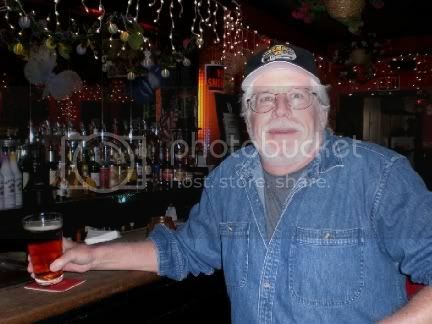 Deciding on a beer at Pete's is one of these circumstances. As I have mentioned before, one of the things I like about Pete's is not only the decent selection of beers they offer, but the fact that they change their offerings quite frequently. As a result you need to peruse the beer menu, thoughtfully posted above the bar, before deciding on what you want. After pondering for a few minutes I decided to start with the Palm Belgian Amber, and I thought it was a good decision. Leigh Ann, the bartender, agreed . Palm is an old Belgian brewery that has been around from the 1700s so, as you might expect, by now they have the brewing process down pretty well. 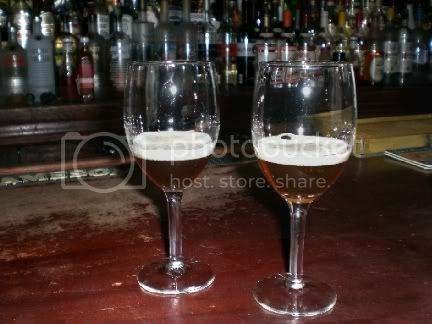 The Palm Amber is decently strong at 5.4% and is a nice golden color with a firm white head. Not too much hops that I could detect, but certainly not a sweet beer by any means. It was quite good. I generally like beers turned out by the Six Points Brewery located not too far from me in Red Hook, Brooklyn. When I saw the Six Points Ryetious I had to try it, and I wasn't disappointed. I think the Six Points Brewery is now going by the name Sixpoint Craft Ales. It looks as though they are in the process of setting up a website but as of today there is just a single page that is ready. This was a darker beer and was fairly hoppy. Not too heavy, and very drinkable. Well, I came in for the ribs but, as always, I like to check the specials to see if anything looks particularly appealing. The BBQ Jerk Pork Loin looked tempting, but it had been a long time since I had the ribs so that is what I settled on. 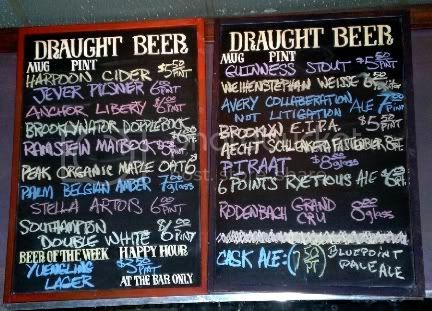 There were a couple of beers that looked like they might go well, the Aecht Schlenkera Fastenbier and the Avery Collaboration Not Litigation. Leigh Ann graciously let me have a taste of each to help me make up my mind. The Avery Collaboration Not Litigation pours a cloudy dark amber and my first sip let me know this was not a beer to be trifled with. It is a hefty 8.72% alcohol and the alcohol comes through this flavorful brew. Because I only had a small taste and the alcohol came through so strongly I can't say that I had enough of it to give you much more information about how it tasted. I knew having a pint of this with my ribs might not be the thing to do though. The Aecht Schlenkera Fastenbier is brewed by Brauerei Heller-Trum in Oberfranken/Bayern, Germany. This is a nice malty beer with enough hops to give it a bit of a bite. It pours dark and has a nice smoky nose to it. It also has a nice smoky taste. I like smoky beers and this is one of the best I have had. Not over-powering, but not so subtle that you have to search for it. It was a reasonable 5.5% and I knew it would go perfectly with the smoky taste of the ribs. I was right and I ended up having two pints (well, there were a lot of ribs). Traditionally this beer is sold only during lent and because of the nourishing yeast used to make it the German's say "Brotzeit already included" "Brotzeit" is the German word for afternoon snack. I think I am going back today though to have a pint of the Avery and I should be able to give you a better description afterwards. That is if I stop at just one pint. I must be strong. This article by Farnoosh Torabi appeared in Monday's edition of am New York, a free publication that is worth every penny of its price. Actually I am being a bit harsh. I read it on a daily basis although I have to say it is a pretty light read. Good to grab when you are getting on a subway though. But I digress. The headline of this article might lead you to believe it will be about a brewery. I know, I am probably being a bit naive. But then the first line of the article is "An Upper West Side brewery has a noisy neighbor problem." 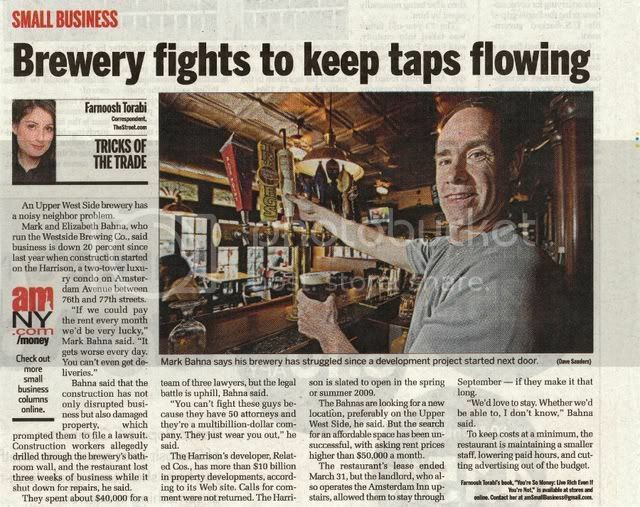 And the caption of the picture is "Mark Bahna says his brewery has struggled since a development project started next door." Personally, I don't think Mr. Bahna actually said that. Although the restaurant and bar that is being talked about is named Westside Brewing Co., no brewing actually takes place there. At one time, long ago, it may have been a brew pub (which is different than a brewery, by the way) but it hasn't been for many a year. You would think a reporter might have noticed the absence of any brewing equipment. 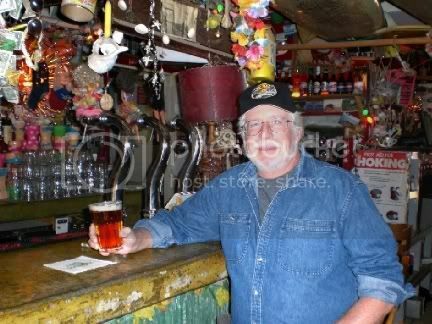 The last time I was there they didn't even pretend to brew any beer, serving no beers that even carried their name. 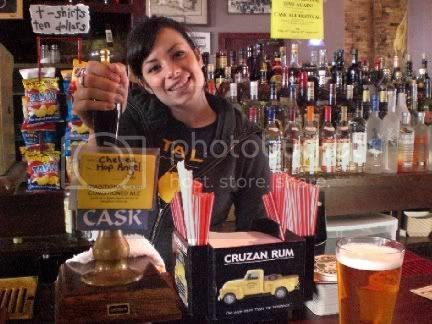 Of course Ms. Torabi probably thinks the Heartland Brewery chain is made up of brew pubs as well. None of Heartland's locations have brewed a drop on their premises for many a year either, not since they expanded beyond two locations and decided it was more efficient (read that as cheaper) to brew their beers off-site and have them delivered. I will cut Heartland some slack here, they also claim that they have better quality control since they consolidated the brewing. And for awhile, maybe still, they had their brewmaster continue to do the brewing. Now don't get me wrong, Heartland still serves mighty good beers brewed to their specifications, they are just no longer brew pubs. Westside Brewery doesn't even bother with that. 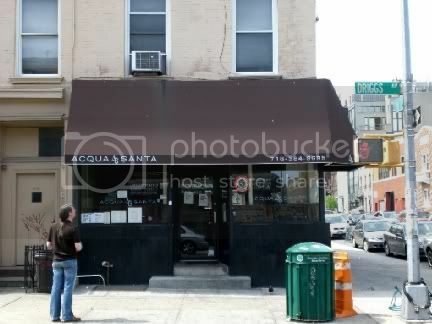 You can go to Rocky Sullivan's in Red Hook and get beers fresh from the Six Point Brewery next door. And, by the way, I don't believe breweries, unlike brew pubs, are allowed to sell their beer for consumption on their premises. I am not sure what kind of an arrangement Chelsea Brewery in Manhattan has, but next door to the brewery proper is a great bar and restaurant where you can get their beers on draft. And mighty good beers they are too. As are the offerings from Six Point. Last Friday I decided to check out the buses (fans of Ken Kesey and the Merry Pranksters will notice the reference in this blog's title) in my neighborhood. I am beginning to realize that these are an under utilized mode of transportation. The subways are crowded and you can't see where you are going, but they are fairly fast. The buses offer a more leisurely mode of travel and you can sight-see as well. Just a short walk from my place is, I discovered, a stop on the longest bus route in New York. 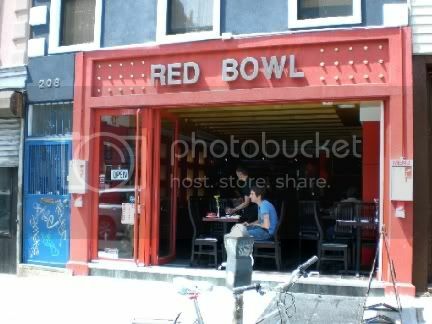 One end is in Red Hook, just a short walk from Rocky Sullivan's bar and the Six Points Brewery. 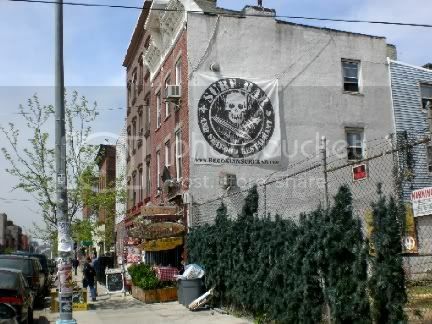 The other end is in Long Island City. As you will see, I haven't gotten to that end yet. But soon, very soon. Trust me, if the weather is decent waiting for a bus is much pleasanter than waiting for a subway. And Friday was a lovely spring day, just perfect for an excursion. 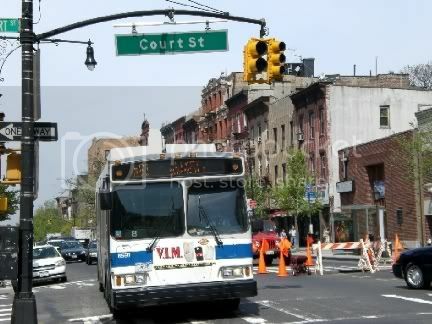 I have already taken this bus, the 61, to Red Hook so today it was off in the other direction. The objective was to take it to Long Island City, see what was interesting there or on the way, and then either stay or stop someplace on the way back. Well, the best laid plans of mice and men and all that rot. Shortly before noon and after about twenty minutes on the bus it passed through Williamsburg. 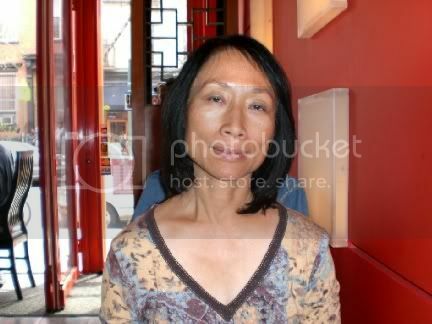 My traveling companion, the Mysterious Chinese Woman, decided she was feeling a bit peckish and wanted to stop for lunch. 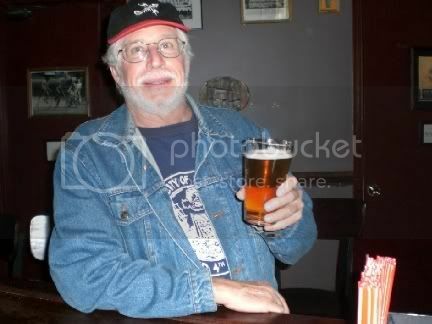 I, of course, am always ready for a beer so there was no argument from me. I got to watch Chuck Norris beat up someone on television to end another exciting episode of Walker, Texas Ranger and then it was time for a real lunch. Just down the block was an interesting looking Pan-Asian restaurant that had a bit of a lunch crowd, so that was where we headed. 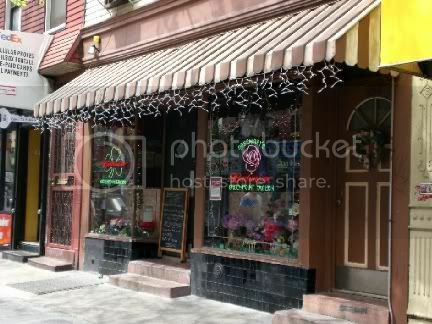 They had a nice little menu and very reasonable prices. I could see why it was popular. 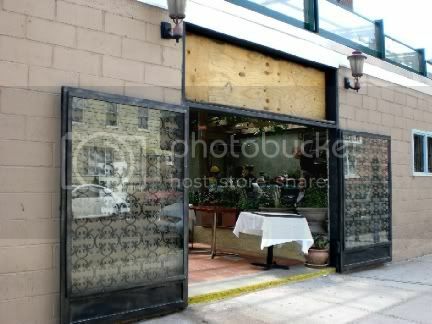 The service was fast and friendly and you could look out the open front and watch the world pass by. 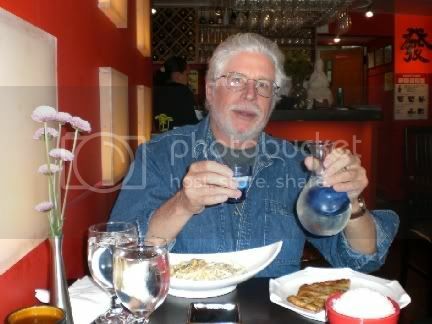 I decided to have a sake with my lunch and that turned out to be a tactical error. I assumed that I would just get a small glass but that proved not to be the case at all. Instead I was served a fairly good portion in a neat little carafe with a pocket for ice to keep the sake chilled. The price was right, just $9 for the carafe, but the portion was a bit more than I anticipated. Nonetheless, I wasn't about to let any go to waste so I manfully finished it off as the Mysterious Chinese Woman looked on approvingly, or not. It was pretty hard to miss considering the size of the sign painted on the wall. The appropriate surf themed signage (why does my spell checker not recognize that word?) hung outside the door. Another digression. If I add "signage" to my spell checker dictionary it still flags it when the word is capitalized. Ain't that strange? They had a limited selection of beers on draft but a larger selection of beers in bottles. I opted for a Blue Point Toasted Lager though because I like it and you don't see it everywhere. 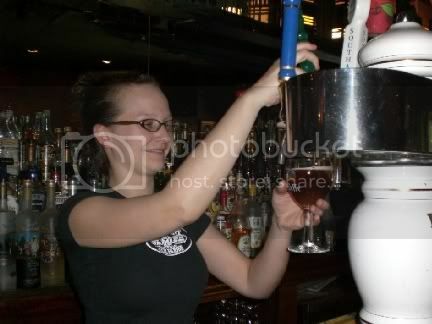 It also helps support the local economy because it is brewed on Long Island. 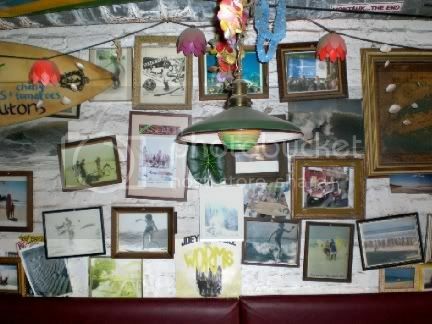 The interior of the bar was a complete clutter of surfer themed stuff, just junk, and a nice collection of surfer pictures that looked like they were outtakes from a Gidget movie. I liked it. 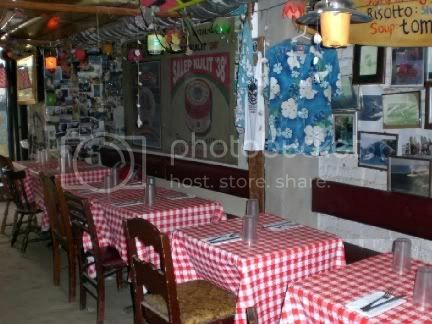 I really didn't check out the menu, but they had a row of tables with red and white checkered tablecloths lined up against the wall opposite the bar. 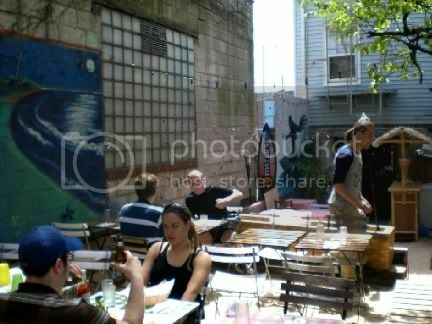 They have a neat outdoor area where a few people were having lunch. It had a set-up for live music so I bet this place is jumping on warm summer evenings. The only thing lacking was an actual view of the water. On the other hand I could watch the construction project across the street. Well, it isn't going to be a wave pool. The bartender said he thought it was gong to be a six story apartment building or something. In Williamsburg six stories is a big deal. The building boom in Williamsburg hasn't abated too much, there are buildings going up all over. I can see why people like to live here though. 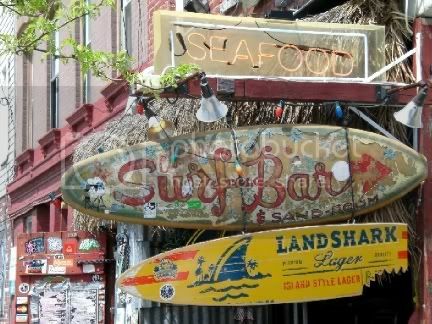 Lot's of restaurants and bars, still reasonable prices, and just one subway stop from Manhattan on the L train. We were going to take the bus home at this point but the Mysterious Chinese Woman decided she wanted a delayed dessert. I was hoping for an espresso and perhaps a Strega. We walked past Acqua Santa and decided to stop in. The front door was locked and it looked empty inside but when we walked around the corner we saw that it had a nice little garden area that was open to the warm spring day. 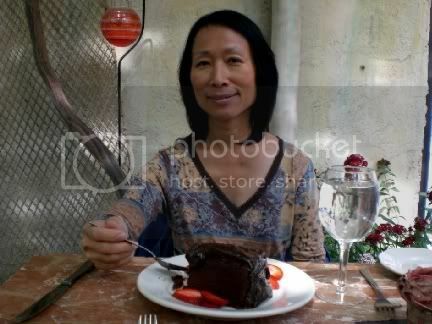 The Mysterious Chinese Woman got what she wanted, a nice piece of chocolate cake served with a delicious raspberry sherbet and sliced strawberrys. 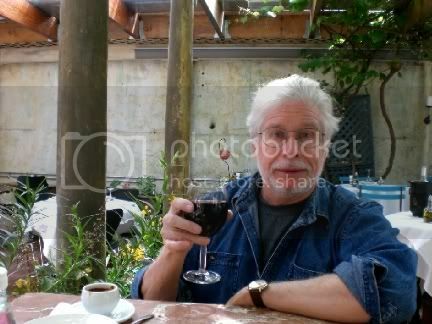 They only served beer and wine here so I settled for an espresso and a glass of their house red. Not a bad fall back, and it was a nice way to end our afternoon in Williamsburg. Now that I know how easy it is to get to this neighborhood by bus I will be returning more often. By subway, from where I live, you have to take the G subway and that is notorious for being unreliable. The alternative would be to take the subway to 14th street in Manhattan and then transfer to the L train. Also not convenient and would take much longer. The bus is just perfect. All in all it was a fun afternoon even though it took that unexpected turn. Next time my resolve will be better, or we leave earlier and have lunch somewhere in Long Island City or on the way back. After checking the bus map I saw that Long Island City wasn't that much further.